Welcome BOS members and all interested in birding Western New York and Niagara Peninsula of Ontario! 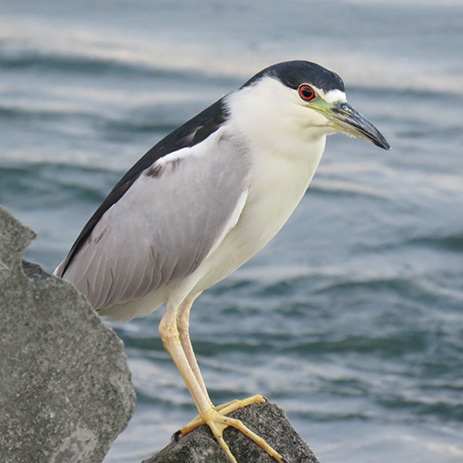 Black-crowned Night-Heron photographed along the Bird Island Pier. The month of April starts big and ends big! The onslaught of migrants begins in earnest this month. This is the best month to spend some time at the local hawk watch in Hamburg. This all-volunteer hawkwatch will have an official counter stationed here daily, unless it's pouring rain. April offers the best diversity for migrating raptors. In addition to highlights of Golden Eagle, Goshawk and Rough-legged Hawk, other species such as diurnal migrant Short-eared Owls, Sandhill Crane, Snow Goose and other rarities have occurred. Pileated Woodpeckers frequently fly through the woods here and this is one of the best spots to cross paths with a Vesper Sparrow during migration. Iroquois NWR is booming with migrant waterfowl now. Drakes in their full alternate plumage are dazzling to see. Herons and egrets are newly returned and displaying in their rookeries. Osprey are back on their nesting platforms throughout the refuge system. American Bitterns and Virginia Rails will be calling in the marshes. Another gem to be found here is the Black Tern, the last nesting colony in WNY! Our local migrant hot spots are receiving lots of attention as passerines begin filtering back into town; Hermit Thrush, Brown Thrasher, Ruby-crowned Kinglet, Yellow-bellied Sapsucker. Warm fronts at the end of the month will usher in the first warblers and vireos of the season. Get your hummingbird feeders out as Ruby-throateds and Baltimore Orioles will be looking for fuel. Get your rest! May is up next! The Buffalo Ornithological Society, Inc. (BOS) was established in 1929 to promote the study of the birds of the Niagara Frontier Region. Annual grants are awarded by the BOS to fund member-sponsored avian research projects. We are proud of our extensive scientific research databases, our continuing involvement in environmental and conservation activities that impact birds, and our promotion of the enjoyment of ornithology. The BOS coverage area includes Western New York and parts of nearby Ontario, Canada. This region is rich in bird life with over 380 species and 25 recognizable subspecies of birds recorded. Explore our site to learn more about where to report and find birds, both regional specialties and rare visitors. The Buffalo Ornithological Society has something to offer to anyone passionate about birds: from the backyard feeder- watcher, the avid lister or the environmental activist, to the dedicated citizen scientist or the professional ornithologist. Society activities include regular programs, field trips, intensive long-term bird counts, checklist and date guide development, varied research activities, and involvement in local conservation efforts. We invite you to join in the activities of the society! Hamburg Hawk Watch at Lakeside Memorial Park in Hamburg (off Camp Road between Routes 5 & 20). Stop by between 10 AM and 3 PM (weather permitting)! If you can help out, please contact Jim Landau (716-941-3869 or landaujr@gmail.com). 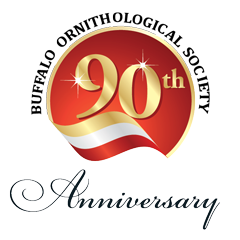 Several field trips, meetings, and events have recently been added to our calendar. Take a look and be sure to join us at a meeting or on one of our field trips! Meet at 9:30 AM in the parking lot at Braddock Bay State Park, 199 E Manitou Road, 14468. David Gordon leads this joint trip with the RBA (Rochester Birding Association). Weather permitting, we will indulge in the spectacle of spring hawk migration from the hawkwatch platform. The bay should also have good numbers of waterfowl and the nearby woods may hold new arrival passerines. If owls are present, a short trip to Owl Woods will also enliven the day! This is a full day trip so bring drinks, lunch, snacks, sunscreen and a chair (for hawk watching). Bathrooms are available at the park. Be aware that a lake breeze can develop this time of year which is a cool/cold breeze out of the north compliments of Lake Ontario. Dress appropriately. Meet at 8am at the West Middlebury Baptist Church parking lot on the corner of West Middlebury Rd and Skates Hill Rd, Town of Middlebury, Wyoming County. This trip will be a driving trip with frequent stops for listening and scoping. The trip is primarily on private property owned by the salt company, a restricted area, and adjacent to Carlton Hill MUA. The spring Wild Turkey hunting season begins on May 1, so we will stay clear of the MUA. As we drive the gravel roads, there will be plenty of opportunities to check the large agricultural fields, brushy areas and forested parcels for migrants. Plan for a trip lasting approximately 4 hours. Meet at 8:00 am in the parking lot at the Bathhouse (the big brick building in front of the swimming beach). Join Matt, the park naturalist, for a 2-hour hike for newly arrived migrants. Sited along the Lake Erie Shore, Evangola State Park boasts an eBird checklist of 146 species of birds and has hosted such rarities as White Ibis, Wood Stork and Yellow-throated Warbler! Local breeding birds include Eastern Bluebird and Red-headed Woodpecker. Meet at 7 pm in the Cummings Room. Professor Greg Cunningham, St. John Fisher College will present "Olfaction in Birds". Meet at 7:30am on the observation deck in front of the Visitor Center. This trip will focus on newly arrived neotropical migrants as well as lingering waterfowl and sparrows. Tifft holds the distinctive honor of having the highest number of species recorded on premises in our region - over 250! The list of highlights is long and includes Kentucky, Connecticut and Yellow-throated Warblers, Summer Tanager, Sedge Wren, Barn Owl, Yellow-crowned Night-Heron and so much more. We will hike the trails in search of warblers, thrushes and other long-distance migrants as well as look over the marsh for rails and bitterns. If we are lucky, we may see late migrant raptors. This will be an easy walk over level ground and boardwalks, possibly muddy trails. The trip will span the morning hours so make sure to bring a lunch and something to drink. All BOS members should participate in the 82nd annual May Bird Count. BOS members are encouraged to participate. Please help us add to the decades of records that the BOS has collected reflecting population dynamics of the area birdlife. You can be part of a field team or simply count birds at your backyard feeder. All observations are important! If you don't know what section you live in, please contact Bob DeLeon who will put you into contact with the correct section compiler. Please visit the May Count information page on the website at the address below. Thank you so much! Meet at 8pm at the intersection of Wilson and Garringer Roads, Wainfleet, Ontario. This location is north of Morgan's Point. Whips may not start calling until 930 so plan accordingly. SPECIAL NOTE - This trip requires crossing the border into Canada. Proper identification is required (Passport, NEXUS, Enhanced Driver's License). Bridge toll also required. Back by popular demand!!! This trip used to be an annual highlight for BOS members and was led by Bill Burch. Wainfleet Bog's underlying peat material supports plants such as Labrador tea and cotton grass. This year Joe Fell will lead us for an evening trip to the Wainfleet Bog. As evening descends and birds begin singing after the midday lull, we will listen for Wood Thrush, Veery, Mourning Warbler and Alder Flycatcher. Both species of cuckoos breed here and we will be looking for these birds as well. Last year at this time, a Yellow-breasted Chat delighted birders for several days and this species has occurred at this location multiple times over the years. As the skies darken we may see American Woodcock along the roadsides. The stars of the show come next...Eastern Whip-poor-wills. As the sky darkens a bit more, Whips should begin singing and we should hear multiple individuals. The birds frequently come out onto the road to hunt for insects. As we drive we will look for eyeshine from the birds and hopefully get to see them sally up from the road after moths and other insects.